""We are creatures who need to make,"" writes Bidart, succinctly expressing the argument of his recent chapbook, Music Like Dirt, which comprises one half of this new volume. Music Like Dirt was the first chapbook ever to be nominated for a Pulitzer Prize, deservedly so. In it, Bidart, with characteristic ruthlessness, outlines an aesthetic theory so basic that it applies to all of us. The theory begins with Bidart's long-standing interest in fusing the body and the mind, so that the body becomes the fundament of vision and spirit. It's a notion captured famously in a line from Bidart's Desire: ""I hate and-love. The sleepless body hammering a nail nails / itself, hanging crucified."" Now Bidart extends the theory further to fuse existence with creativity: ""But being is making: not only large things, a family, a book, a business: but the shape we give this afternoon, a conversation between two friends, a meal."" Not surprisingly, tropes of sculpture, where art and corporeality meet most literally, dominate this collection. The body that would crucify itself now sculpts itself, albeit violently: ""The stone arm raising a stone hammer / dreams it can descend upon itself."" These themes bleed into the more personal lyrics present in the second half of this volume, most notably in ""Curse,"" a poem of articulate fury addressed to the masterminds of September 11. Sculpture and self-creation resume the stage in ""The Third Hour of the Night,"" a long poem in the voice of Benvenuto Cellini, renaissance sculptor and murderer. Throughout the collection, Bidart alternates between prosy explication and knotted, unpunctuated verse that enacts the poet's chief image: ""within stone / the mind writhes."" 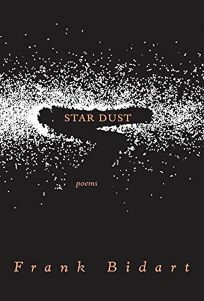 Bidart has recently emerged from the long and relatively thankless editorship of Robert Lowell's collected poems; Star Dust redoubles his claim to his own fame.